MADISON, Wis. – The University of Wisconsin System Board of Regents honored today the recipients of the 2019 Regents’ Teaching Excellence Awards, which mark their 27th anniversary this year. The awards are the UW System’s highest recognition for members of its faculty and academic staff. 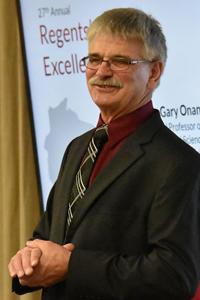 While the life experience of students who enter the UW-River Falls Animal and Food Science program has evolved significantly over the years, Onan said there is one common thread: They all started caring for animals at very young ages. “I firmly believe that activity, more than many others, develops maturity in young people. It enhances a human desire for creativity, teaches people to be responsible, teaches them empathy, and teaches them to learn from their mistakes,” Onan said. The 4-H program also does that, he added, and he urged the UW System and its Board to work with legislative leaders to continue to support 4-H.
Others on the selection committee were Regents Mike Jones, Jason Plante, and Carolyn Stanford Taylor. See more photos on the photo gallery and the Board of Regents Awards website. In his regular report to the Board, Regent President John Robert Behling provided an update on two ongoing chancellor searches. First, at UW-Whitewater, he told Regents that the search-and-screen committee, under the leadership of chair Regent Tracey Klein, will be meeting that very afternoon to determine the semifinalist candidates from its national search who will be interviewed later this month. President Cross opened his report with an update on the 2019-21 biennial budget, noting that UW System is working closely with the Governor and legislative leaders as the budget moves into the Joint Finance Committee process. 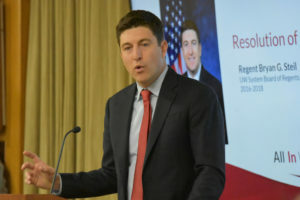 Regarding the capital budget request, he noted that legislators from both parties and the Governor’s office have indicated their understanding of the risks of not investing in the university’s infrastructure and the costs of further delaying critical renovation, remodeling, and replacement projects. 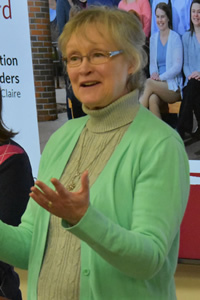 Cross also told Regents that two UW System campuses have been selected to host public listening sessions as part of the Joint Finance budget tour: UW-River Falls on April 15 and UW-Green Bay on April 24. “These are great opportunities to showcase our campuses and communicate directly with legislative leaders throughout the state,” Cross said. On the federal front, Cross updated the Board on his recent trip to Washington, D.C., with UW-Parkside Chancellor Debbie Ford, UW-Platteville Chancellor Dennis Shields, Regent Ryan Ring, as well as Associate Vice President Kris Andrews and David Specht-Boardman of the federal relations team. “Our purpose was to advocate for financial aid for our students and for Congress to lift the budget caps to allow needed investments in education and research funding,” Cross said. Regarding President Trump’s March 21 executive order directing federal agencies, including the Department of Education, to verify that institutions receiving federal grants are in compliance with existing federal law on free speech, Cross pointed to Regent Policy Document 4-21, approved by the Board in October 2017. The UW System’s “Commitment to Academic Freedom and Freedom of Expression” policy was in front of the issue, and he said it appears the University is well within the executive order’s guidelines. Cross also provided brief updates on the recent meeting of the UW System Business Council, hosted by the Packers in Green Bay. “In this era of high demand for labor, our focus was on talent – and on solutions the university can provide to help companies attract, develop and retain a highly educated workforce,” Cross said. He said the Business Council expressed strong interest in partnering in those efforts. 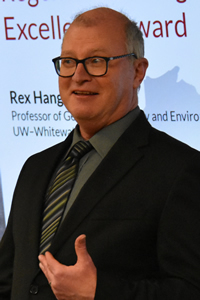 Regarding the recent meeting of the Dairy Task Force, which was co-sponsored by UW System and DATCP, Cross said the group has brought forward more than 50 recommendations to help address challenges facing the dairy industry. “We look forward to working with legislators and Gov. Evers as the proposals move forward,” he said. In news from UW-Stevens Point, as part of his undergraduate research, junior Tyler Hillery is helping Central Wisconsin employers create a hiring process that minimizes employee turnover and saves training dollars. Hillery and his faculty adviser Nikolaus Butz are applying a “Grit Scale” of personality traits, such as courage and endurance, to help local businesses retain employees. Hillery will present his research at UW System’s 16th annual “Research in the Rotunda” in April. The Regents presented Regent Emeritus Bryan Steil with a Resolution of Appreciation for his service on the Board, from 2016-2018. Steil stepped down when he was elected to Congress, representing Wisconsin’s 1st District. “I am very proud of our work as Regents to make sure education is affordable and accessible, and I am honored and confident that the Board will continue this,” Steil said. Approved UW-Madison’s request for authority to execute the remainder of the design contract and construct the UW-managed Medical Science Center, Chemistry Learning Center Remodel Project. See photo gallery from the April 5, 2019, meeting. The University of Wisconsin System Board of Regents will next meet June 6-7, 2019, at UW-Milwaukee.